Birds Eye View of Boston Harbor Along the South Shore to Provincetown. 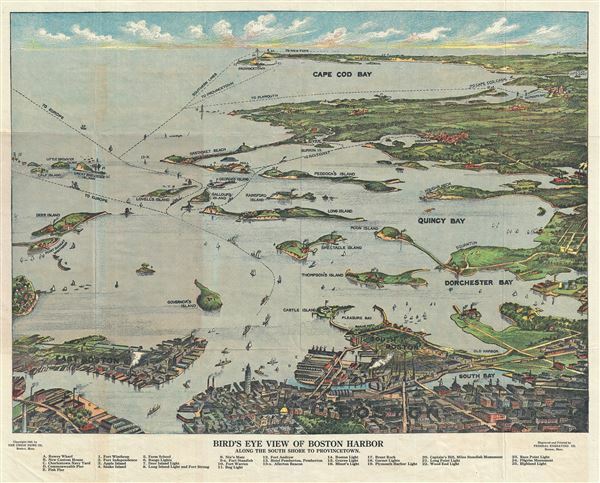 This is a remarkable 1920 chromolithograph map and view of the Boston Harbor from Boston to Provincetown. It covers all of Cape Cod Bay, Quincy Bay and Dorchester Bay with the communities of Boston, east Boston, south Boston, Dorchester, Quincy, Hough's Neck, Mingham, Nantucket, Duxbury, Plymouth, Cohasset, Scituate, and Provincetown noted. Many of the islands in Boston Harbor, including Moon Island, Spectacle Island, Thomson's Island, Long Island, Governor's Island, and others are also identified. An index in the bottom margin lists several other important places identified on the map. Ferry and steamboat routes are noted throughout. This view, dated to 1920 and copyrighted by the Union News Company is based upon the late 19th century view of John Murphy. This view was engraved and printed by the Federal Engraving Co., and published by the Union News Company of New York and Boston. Very good. Minor wear along original fold lines. Professionally flattened and backed with archival tissue. Accompanied by original binder.